Automatically identifies and updates your business information in real-time so you don’t have to. 99.7% customers feel they’re talking to a human by having engaging and "personal" conversations. Customers never download an app and message using Facebook, Google, your website or any platform. Restaurants receive and respond using one OpenCity app. High-quality responses, enabling your staff to focus more on operations. The Assistant strengthens customer loyalty, while driving more traffic to your business. Seamlessly books and recommends reservations, curates private event inquiries, driving more revenue for your business. See the OpenCity magic on your website. Run your business from anywhere. Easy to use iPhone, iPad, Android, computer apps. Create templates so staff can quickly respond to customer inquiries. Multiple staff can view and respond to guest inquiries, simultaneously. Immediatley respond to customers privately to avoid negative posts on social media. Inquiries automatically routed to appropriate staff member - private events routed to sales. 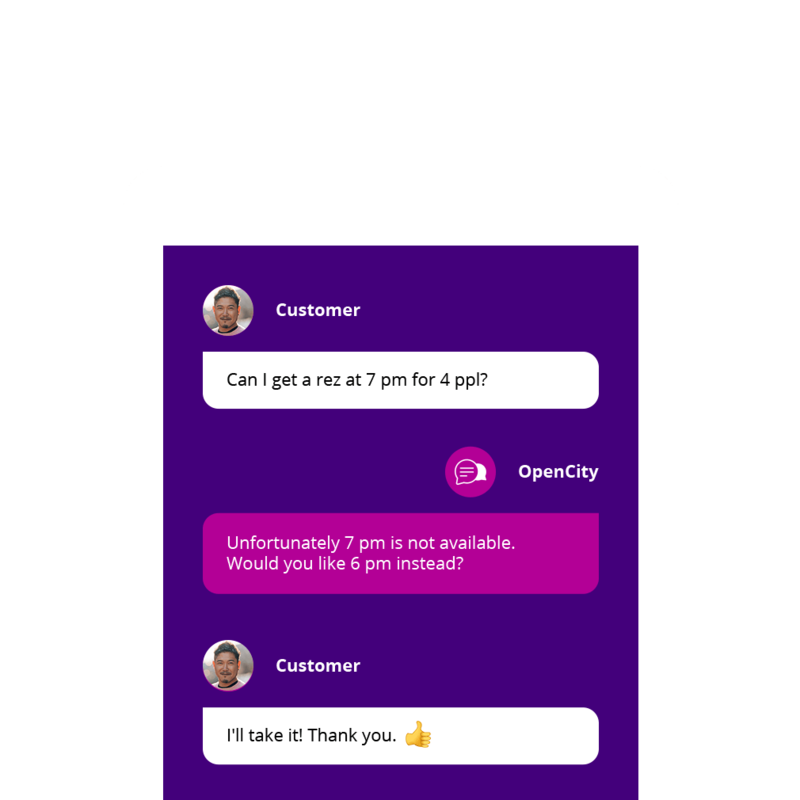 Access conversations to view how OpenCity and your team respond to customer inquiries. Seamlessly books and recommends reservations, private events and more. Customers expect instant responses. OpenCity allows you to always be "open" for business. Everyone is on the go. Customers expect speed and accuracy, to fit their lifestyle and dining preferences. The OpenCity Assistant responds to every customer inquiry, 24/7. It’s that easy. No app downloads. Customers can easily text from your website, SMS, Facebook, Google and more. Anniversary, wedding, birthday, corporate outing, any life event. OpenCity has you covered. Everybody texts. It’s how we communicate in their daily lives. Your business can now enter the circle of trust. Managing a restaurant has a lot of moving parts. OpenCity makes it easy to respond to all inquiries in real time. Seamlessly integrates with other tech products you use and love. It’s so easy your team will be up to speed in minutes. Virtually add an extra staff member without increasing the headcount, making your whole team more efficient. Manage private events, book reservations and get new customers 24/7, even when you’re closed. Improve workforce efficiency. OpenCity enables your staff to focus on operations, customer experience and loyalty. We’re here for you. You’re just minutes away from joining our growing community of happy customers. Absolutely free to start now. No credit card required.